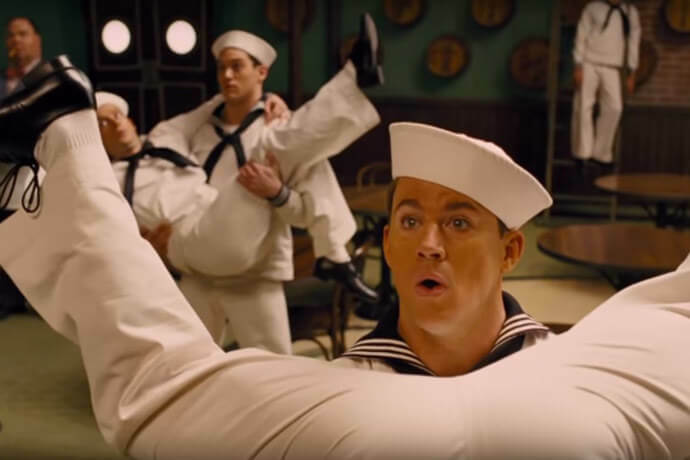 The funniest scene in Hail, Caesar! is a microcosm of the film’s overall genius. Foppish British director Laurence Laurentz (Ralph Fiennes) tries to get Hobie Doyle (Alden Ehrenreich), a singin’ and dancin’ cowboy movie star, to deliver a single line of dialogue in a refined, “rueful” way. They repeat the line back and forth to increasingly hilarious effect. It’s such a simple conceit, and yet the instructions Laurentz gives reveal so much intelligence, as he suggests his wooden Western fella begin the scene with a “mirthful chuckle.” Hail, Caesar! captures laughs from literal slapstick, insane imagery and witty banter. But all of it is under the moon of a fascinating argument about “faith” and art. What’s certain is his current job isn’t easy. He has to simultaneously manage screen siren DeeAnna Moran (Scarlett Johannsson) and her out-of-wedlock pregnancy; the abduction of Baird Whitlock (George Clooney), the star of the studio’s biggest picture in production; twin sister gossip columnists (Tilda Swinton) who are hungry to stir up trouble and, as is always a nuisance, an organized cell of communists. Along the way, Channing Tatum does an impressive dance number, the adorable Hobie tries to adorably save the day and Clooney gets slapped a lot. There may not be a better scene in a comedy all year than the one in which Mannix calls in all manner of religious leaders, including a Rabbi, to determine if anything in their titular epic is offensive on a theological level. The discussion isn’t just hilarious wordplay and banter, it’s a brilliantly stated reminder of the intellectual messiness inherent in faith. The Coen Brothers have mined Hollywood’s soul before, most notably in Barton Fink, but this feels different, more optimistic. It affirms that art does matter as more than just a money-making product, even if such affirmation requires a delusional leap of faith. Hail, Caesar! doesn’t get by on just it’s brains; it’s a looker, too! Roger Deakin’s lush cinematography replicates and recreates not the realism of the way movies felt and looked in the golden age, but how they felt. It’s a true visual splendor, right down to a gorgeous Russian propaganda painting come-to-life near the end. An impossibly great cast paired with heady themes and burning dialogue (“We’re not talking about money, we’re talking about economics!”), Hail, Caesar! would have been at home had it been released for Oscar contention. Forgive it the release date, and see it soon.